HEATHERS THE MUSICAL is based on the cult classic 1988 film of the same name. Heathers is the story of Veronica Sawyer, a senior at the fictional Westerberg High. Veronica longs to be cool like the clique of ‘it-girls’ that runs Westerberg: the unaffected, unattainable Heathers. Unfortunately, in addition to awesome levels of popularity, the Heathers are also cruel, choosing to mock and bully their kingdom into submission. When Veronica uses her skills as a forger to get the Heathers out of detention, she impresses their leader Heather Chandler- so much so that they agree to let her into their exclusive club. At first, Veronica is thrilled – until she finds out that being one of the Heathers means bullying the same kids she used to call friends. Meanwhile, Veronica finds herself attracted to a mysterious newcomer at school named Jason Dean (JD). When an innocent drink mix-up results in the accidental poisoning of Heather Chandler, JD convinces Veronica to stage Heather’s suicide. The results are so successful that Veronica and JD, exhilarated with their newfound power, resolve to rid Westerberg of the cruelly popular elite forever. HEATHERS, directed by award-winning director-choreographer Jamie Watt (Higher and Higher, 9 to 5: The Musical), storms the stage from May 25 – June 16. Tickets are available for evening and matinee performances. With an all-star local cast of triple-threat performers, the decidedly dark comedy with its pumping 80’s score and shoulder pads for days will leave you breathless with its quick wit, stunning choreography and brutal, offensive humour. 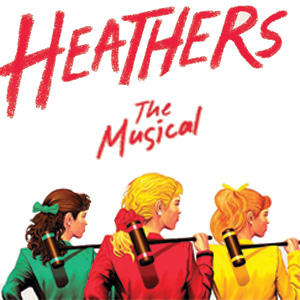 So tease your hair, put on your boldest neon eyeshadow and join the HEATHERS…it’ll be so VERY!